Hi, my name is Piper. 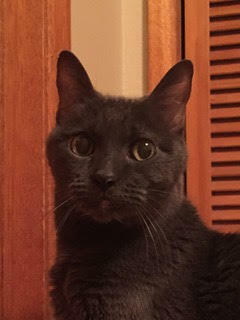 I’m a petite kitty who is perhaps of Russian Blue heritage but my owners aren’t sure. I am a beautiful princess who likes to be treated as such! I would love to move away from this busy household that includes a teenage boy that, honestly, I’m not very fond of. I am a little timid until you get to know me but I love being pet and having my neck scratched. I will return the love with head-butts and lots of purring but don’t particularly like being held. I am a great nap and nighttime buddy and love to sleep as close to you as I can get. I’m 9 years old and just under 10 lbs., spayed, up to date on vaccines and have a clean bill of health from my vet. I still have my claws but I don’t scratch much, only on the carpeted stairs that look to me like a giant scratching post. I need an owner that appreciates me for the princess that I am! Before this busy and loud family, I lived in a nursing home environment and would love to return to that kind of calm. Please contact Christina at: walker737@comcast.net or 503-297-1413 to adopt me!